On Sunday, the JDU had announced that the party would vote against the Citizenship (Amendment) Bill, 2019, in the Rajya Sabha. 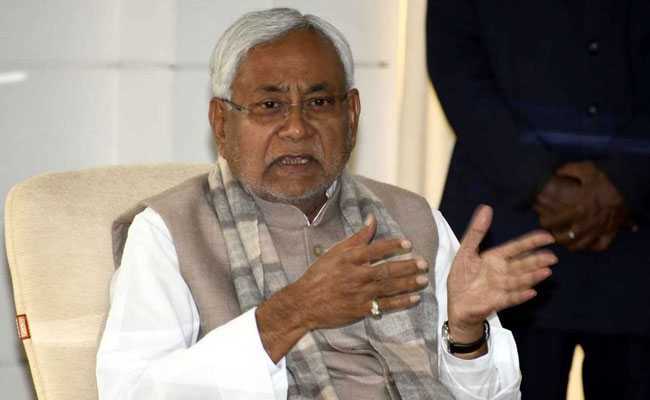 Bihar Chief Minister Nitish Kumar on Monday defended the Janata Dal (United)'s decision to vote against the citizenship bill in the Rajya Sabha. "When the issue of citizenship bill cropped up, we took the view that the identity of Assamese people must not come under any sort of attack. We expressed our views to the Union Home Ministry and the BJP leadership as well," Mr Kumar, who is also the JDU president, told reporters in Patna on the sidelines of his weekly public-interaction programme, ''Lok Samvad''. "I do not think it's going to cause any problems in our alliance with the BJP. We have been allies for long, but maintained our independent stand on a number of issues. The AGP (Asom Gana Parishad), too, had sought our support on this issue. The BJP, being in power in Assam and at the Centre, is empowered to take a final call... but, we are free to voice our differences," Mr Kumar added. Bharatiya Janata Party ministers Prem Kumar, Mangal Pandey and Vijay Sinha were present at the event. The chief minister questioned the stance of the Congress, which had staged a walkout in the Lok Sabha when the bill was being tabled, wondering if the party would follow the same course in the Upper House, where the National Democratic Alliance was short of majority. "We wonder what the Congress is up to. It staged a walkout in the Lok Sabha, where it did not have adequate numbers and its taking part in the voting would not have made much of a difference. But, in the Rajya Sabha, it has substantial numbers and, if it abstains, it may end up helping the bill getting passed," Mr Kumar remarked. The JDU has six members, including Deputy Chairman Harivansh, in the Upper House at present. The citizenship bill, which was passed in the Lower House on January 8 and is pending in the Rajya Sabha, has led to huge protests in Assam as well as other northeastern states. The AGP had pulled out of the BJP-led government in Assam in protest against the bill that seeks to provide citizenship to non-Muslims from Bangladesh, Pakistan and Afghanistan. Mr Kumar had earlier met a delegation of the AGP leaders in Patna and had assured them of support over the bill. Reacting to the JDU's stance, senior Congress leader Prem Chandra Mishra said the former was a party comprising "habitual defectors, who have no ideology and are only interested in power". Their stand on issues like the citizenship bill, uniform civil code, Ayodhya and Article 370 has just one aim to hoodwink minority voters, he said. "The Congress high command will take a decision on what strategy we have to adopt on the bill in the Rajya Sabha. But, at least the people have no doubts about our ideology. Nobody can imagine that the Congress is having any covert understanding with the BJP. On the other hand, the JDU has no ideology. Its accusation that the Congress is being equivocal is outrageous," Mr Mishra added.